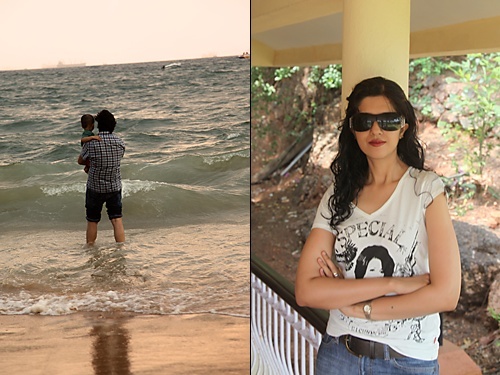 Ro whisked me away to Goa for my birthday this year for some sun, sand and air. It was a welcome break for the three of us as we spent exclusive time with each other. Watching the sunrise amidst the chirping birds as I did my daily pranayam and suryanamsakar on the green lawn in front of our villa, the baby playing in the sand, soaking in the cool breeze and fresh air, hearing the sounds made by the waves as they splashed across and then silently moved away, seeing the sunset and absorbing the scenic beauty of nature made for a very rejuvenating holiday. 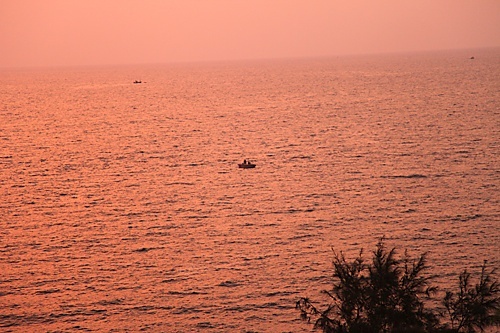 The many visits to Goa when I lived down south did not have the same effect on me, as being stuck in the brick & mortar & gas filled city of Mumbai, I value these getaways even more than before. 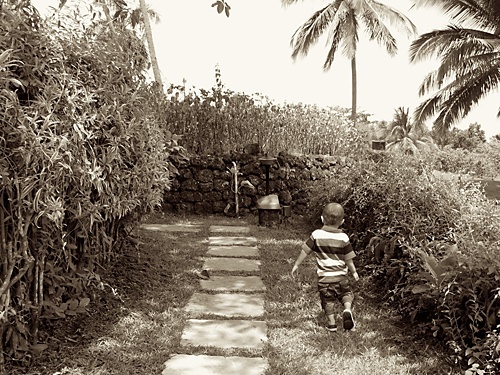 The highlight of this visit for both of us as parents was to see our little one pottering about the lawn, the beach, the roads and exploring new sights and sounds, getting excited about everything around him and getting thrilled with the buggy rides. I have always liked the customer friendly atmosphere prevalent in the Taj group of hotels and I cherished it even more this time as we were their guests with a toddler in tow. The genuine service attitude and attention to details as well as catering to specific demands is simply exemplary, an outcome of strong inbuilt values. 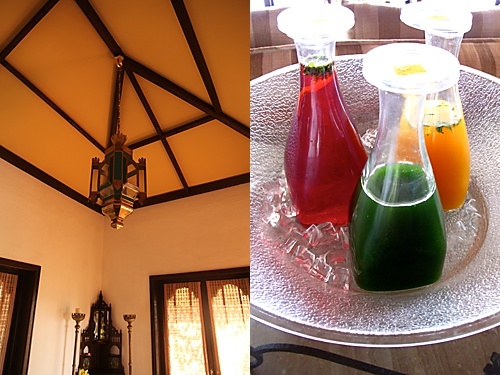 Very few organizations have that inherent quality to make the guest feel at home and the Taj scores solid points here. When I was talking to Chef Santan at the Fort Aguada, he handed over some Goan recipes, the first of which was a fish curry. Realizing that I’m a vegetarian, he smiled sweetly and said that I could replace any vegetable of my choice in this curry. Back home, when I opened the recipes my eyes fell upon this curry again and I realized that this was not alien to me at all. 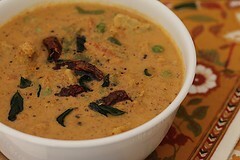 Infact, I had grown up eating these coconut spiced gravies and they figure highly on my comfort food list. This curry is very similar to the many curries that my mother makes. Making this, takes me back to my mother’s kitchen and the meals served at my parental home eaten with siblings, cousins, family and friends. Reminiscent of the coastal scents of Goa, the coconut trees, pristine beaches and fresh air, this curry with assorted vegetables in a coconut spiced gravy can be enjoyed over a lunch, brunch or dinner affair. A bowl of this curry, some well cooked basmati rice served with a pot of yogurt would make some souls happy for sure! Wonderful recipe.. looks so tempting and inviting.. amazing snaps !! Awesome! What is awesome, is left to the figment of your imagination! :-))!! Brilliant pictures! Keep up the wonderful work and by the way, when am I getting a chance to taste this creation? @Ro Very soon, when I get back home. What beautiful pictures. 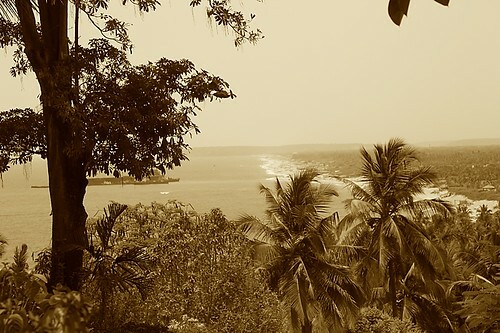 I have been to Goa just once about 10 years ago and would love to go again. Simple breath-taking views. You have a beautiful collection of recipes!! gorgeous pics! And lovely curry! Priya…you said it right…simple breath taking views and the beauty of nature! Thank you Anamika & Sarah. This looks very very yummy 🙂 but im also interested in the original recipe with the fish, could i perhaps get that recipe? Love your website for the lovely healthy recipes. You pen your thoughts so beautifully with each of your recipe posts. The day I make something from your website, my husband compliments my cooking for the day. So thanks to you for all the compliments I received from my family for the recipes!!! Why don't you add more of your family photos in your website? Your mum, sister, husband, son & yourself, you all are so lovely. Jayu: Very kind and sweet of you to give me such lovely compliments! And I'm so happy that you receive compliments from your husband after cooking from here! That's a great compliment for me indeed! The story, post has to support the pictures strongly and since this is a public arena I find myself holding back a little when it comes to posting pictures of my son. Maybe one day ill be more comfortable. Thank you for your interest and I look forward to hearing from you again. i made this and it was a wonderful lunch for us today. instead of cooking it on stove top, i just steamed the whole dish. i feel stove top cooking will add more flavour to it. thanks a lot for this recipe. Sounds great. I am glad you enjoyed Goa. Waiting for some more delicious recipes from you. Nice cecipe, but I prefer to make the masala, fry the masala, add veg, cook for a couple of minutes, then add water, the veg absorbs some of the flavor of the masala, I add water based on how thick I want the gravy to be as well. I cut the veg small so they cook fast and I put them into the pot one by one based on how fast they cook. I generally serve this with rice. 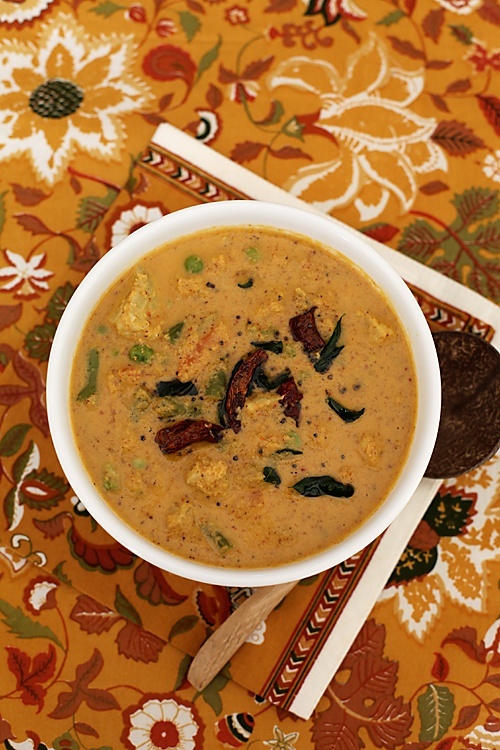 Louise: India is the home of curries and hundreds of varieties of them are prepared here. This is one variation. Your method is great too and I use that style many a time too, its just that this curry doesnt happen to be one. 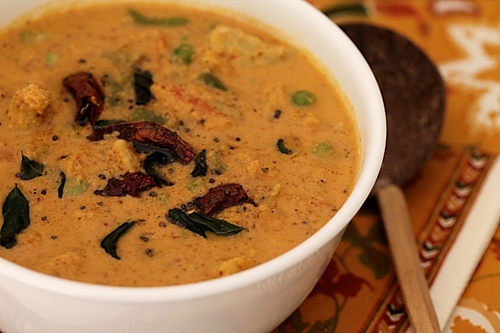 How could this recipe be adapted using dried coconut or canned coconut milk? Looks great & thank you. Rosie: I like red rice too. Nice that you ate it with red rice. Ashwini: Always happy to hear from you! Erin: You can try using canned coconut milk and add it along with the ground spices. Fresh or frozen grated coconut is available and it would be best if you could use it to maintain the sanctity of the recipe. tejal: I really appreciate your gesture. So happy to know that you liked this curry!